Propagation has again been excellent on 10m. I heard many US stations and other DX at good strength. I didn't make many contacts, though. Most of the stations I was hearing were enjoying 5 or 10 minute QSOs. You can use up a lot of time listening to such contacts, especially when you make your call and the station you are hoping to work replies to someone else and not you, so you get to wait another 5 or 10 minutes for the next chance. Not that I'm complaining. But it doesn't help that I refuse to use bad operating tactics to get a contact. One station I waited for got angry and went QRT because other European stations were calling over the final of the station he was working. If I can only hear the DX side of the conversation I won't call until I hear the DX call CQ or say QRZ or listening for any calls. Others do, and too often they get rewarded with a contact. It makes me angry, too. My first contact of the day was with UT1AN Alex on 10m FM. His QTH is not far from Kharkiv, Olga's home town. Alex gave me an S9+20dB report. 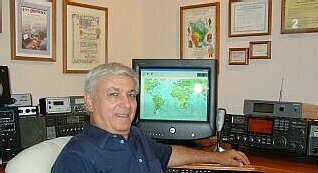 The last - so far, anyway, was on 10m SSB with W8ERN Angelo in Brighton, Michigan, pictured right. I waited a long time before my call was heard. But it was worth the wait because Angelo replied with are you the G4ILO that wrote the VOAProp software? I 'fessed up and Angelo told me how much he liked the program. We also talked about web pages and logging programs. Angelo's web page is produced using a software program called CommCat Live. You can hear live streaming audio from his station and see a graphical S meter plot of the station he is receiving. He told me my signal - 100w to the attic dipole - was almost peaking 20 over 9 and sure enough when I looked at the screen it was. Perhaps my QTH is not so bad after all. Here is the proof: W8ERN's web page snapped while I was in QSO with him. CommCat certainly adds interest to a ham radio web page. Unfortunately - but not surprisingly - it doesn't support my home-written logging program KComm. It sure makes the hobby infinitely more fulfilling when conversations have some actual content to them; unfortunately, they're few & far between. I am really glad to see you are feeling a bit better. I have also been lucky and while working at home I have had the chance of a few QSOs in the last couple days while 10/12/15m have been open. A couple really memorable. I have had similar experience, in that I am also too polite, so I never break in or step on tails. I always wait for my queue, but this means I loose out. I'd rather be known to be polite though, even if it is really frustrating at times. I have been listen to 10 meters here in Arizona and would you believe it's nothing but static. That's right I have yet to hear how hot 10 meters is.